FINAL FANTASY Record Keeper: Octopath Traveler Collab Web Campaign Underway! 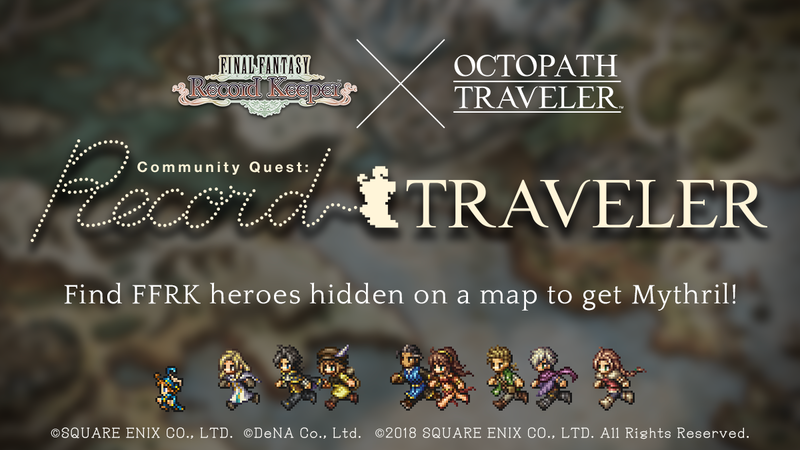 To commemorate the Octopath Traveler collaboration Crossing Paths (beginning 5:00 PM 9/12 PST (1:00 AM 9/13 UTC)), we have launched a special web campaign called Community Quest: Record Traveler! Find FF characters lost in the world of Octopath Traveler as you encounter characters from Octopath Traveler. You'll receive points every time you find a character, and get a hint for finding the next one. Begin by tapping the Octopath Traveler character on the map, then tap the glowing spots and gather hints. You can complete a map by finding eight FF characters. But be careful! If you tap the wrong spot and encounter an FF boss, it's Game Over! Get in-game rewards based on the total points earned by the entire community! Starting on Day 2, 4★ and 5★ characters will be added! Find them for even more in-game rewards! * 4★ characters will be added on 9/7 PST (9/8 UTC) and 9/8 PST (9/9 UTC) at 6:00 PM PST (2:00 AM UTC). 5★ characters will be added at 6:00 PM 9/9 PST (2:00 AM 9/10 UTC). * Rewards will be distributed for each milestone reached. Find lots of FF characters and aim for a high score! We hope you enjoy searching for FF characters across the world of Octopath Traveler as you wait for the collaboration event to start.